The best things in life take time and patience. Case in point: bolognese. 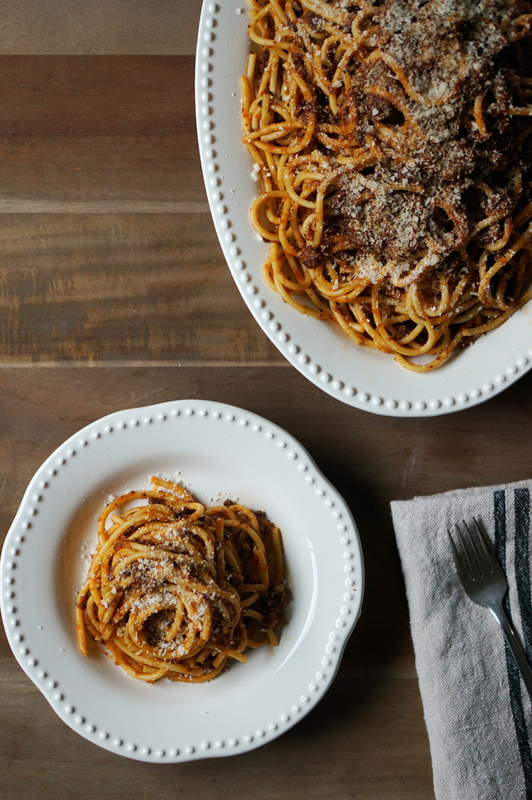 There’s no short cut to this hearty and thick tomato meat sauce, but the results are so worth it. 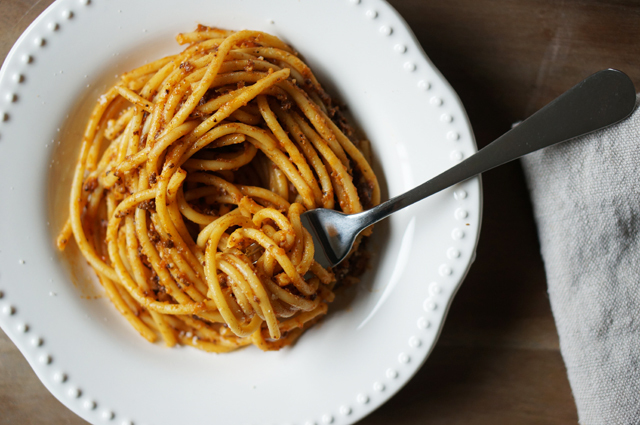 I love a smooth consistency for my bolognese and the best way to achieve this is by pureeing the mirepoix in a food processor and using tomato paste. This recipe makes more than enough sauce for 1 pound of pasta, and probably enough for 2 pounds. My favorite is bucatini, but of course you can use anything you’d like. Instead of using beef, I decided to go with ground lamb (perfect for an Easter meal) and it was so good I think I’ll always use lamb from now on! Roughly chop the carrots, onions and celery. 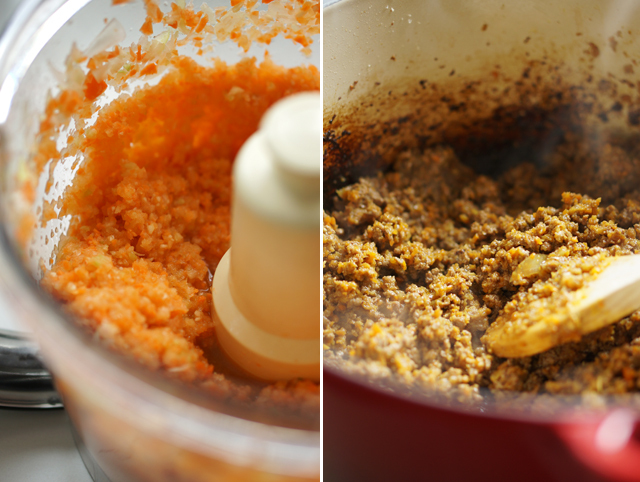 Place in a food processor, add garlic cloves and puree. Heat a large wide pot on medium high heat and add olive oil. Add salt and saute the vegetables until soft and caramelized, about 10-15 minutes. Add ground lamb, add salt, and saute until browned, another 10 minutes. Add tomato paste and stir to incorporate. Add wine and deglaze the bottom of the pan with the wine. Add about 4 cups of water. Add thyme. 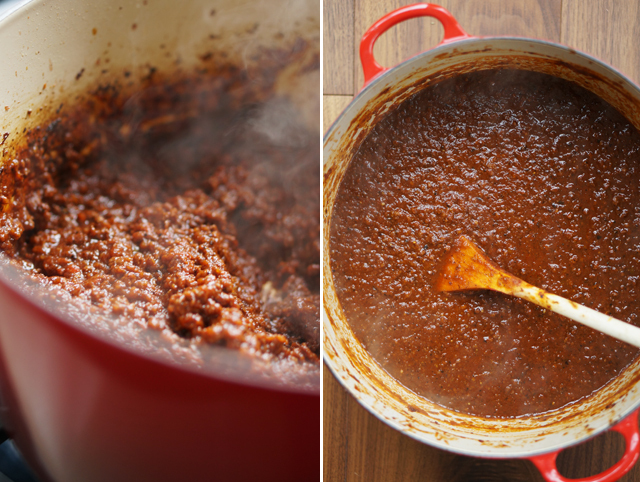 The bolognese will be watery, but it will thicken again as you continue to cook the sauce. Simmer the sauce on low heat with the lid off. Check on it occasionally, stirring. When most of the water evaporates and the sauce becomes thick again, add more water, about 3-4 cups. Repeat this process of adding water and cooking down the sauce about half way through. The final consistency should be not too thick but not too watery, like the photo above on the right. Cook for a total of 3 hours. Cook pasta according to package directions in well salted boiling water. Reserve some pasta water and add to the pasta if it is too thick. 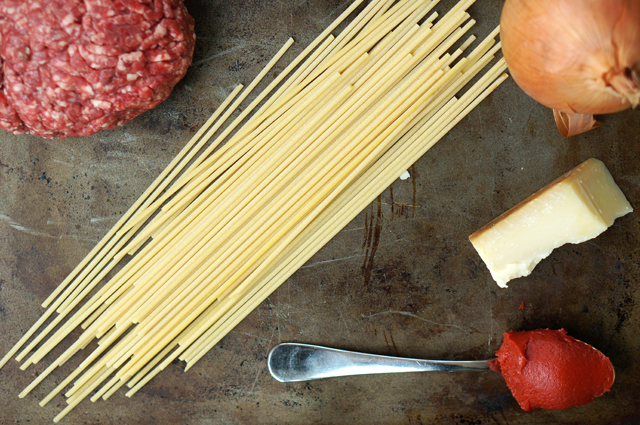 Toss the bolognese in the pasta. Top with grated parmesan and enjoy! I would like to make this a day a head of serving. It will probably season more but do you think I might have to add more water? I would just make the sauce a day before and it should be fine the next day without more water. If you cook it with the pasta the pasta will likely soak up a bit of the moisture in the sauce though. Hope you enjoyed it! What type of red wine do you recommend? I usually use a merlot. The recipe calls for 1.5 cups of tomato paste– I know it sounds like a lot but it isn’t once all the vegetables and meat goes in! This looks incredible. 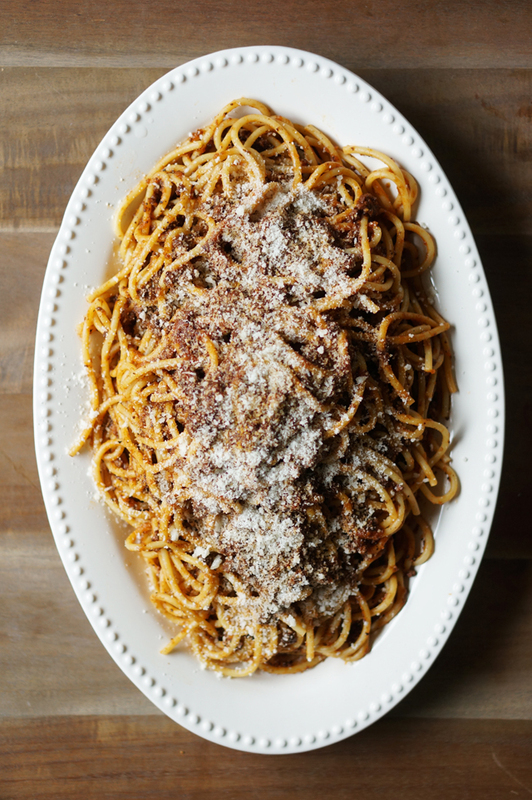 Bolognese is one of my favorite things to make and I love how you’ve made this with lamb. What a gorgeous, comforting meal! That last photo is a masterpiece! This looks delicious. 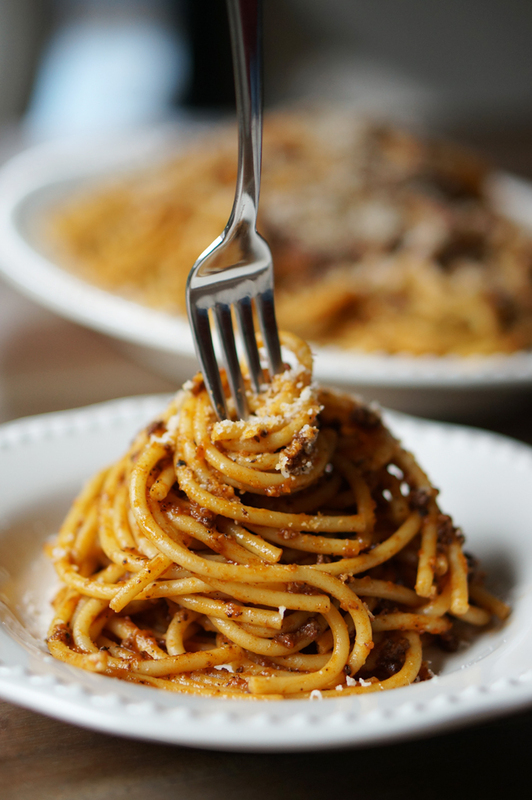 I’ve never made my own homemade bolognese.. this makes me want to make it immediately..
Bolognese sauces go so well with ‘thick’ types of pasta, don’t they (sorry, not very descriptive!) I love the idea of using lamb instead of beef. Since living in Greece I always like to add some cinnamon to my meat sauces, too. Honestly, it works brilliantly! wow. this looks so wonderful. Definitely one of my very favorite meals and I can’t wait to try it with lamb!